It even has a unique feature to make it even faster. The, and we have even seen Bugatti and Ferrari police vehicles. Now a has created what may be the coolest American police vehicle ever. 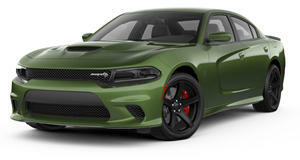 The car starts out as a Dodge Charger Hellcat - not exactly a bad base car - then Armormax equips it with bulletproof cladding and a ton of other unique features. Of course, the car is built for police use so it comes with all the accouterments the cops will need, including lights, ballistic armored glass, bulletproof panels, a push bar, run-flat tires, carbon fiber decals, and more. Of course, if you aren't a police officer and you simply want to buy a bulletproof Hellcat for your own uses, Armormax says that it will sell them to private customers on any Charger model, not just the Hellcat. Armormax says that this particular Hellcat model was "built with presidential security detail in mind," meaning it has special defensive capabilities such as a 110-volt electric shocking system in the door handles. It also has a unique all-wheel-drive conversion, which was supposedly done by the private customer who ordered the car. Dodge doesn't make an AWD Hellcat, but it does build a V6 Charger with this feature as well as the related Jeep Grand Cherokee Trackhawk. Even without the bulletproof bodywork, this Hellcat is extremely unique because it can put its power down better than a standard Hellcat. Pricing will range depending on options and level of bulletproofing. Armormax offers B4, B5, B6, and B7 ballistic protection levels. This particular build cost around $80,000 ( the cost of the Hellcat), so it certainly wasn't cheap. We doubt there will be too many police departments with the budget to buy one, but we challenge you to find a more badass police vehicle than an AWD, bulletproof Hellcat.